Steven (Chicagoland, United States) on 28 September 2011 in Landscape & Rural and Portfolio. Desert varnish, or rock varnish is a orange-yellow to black coating found on exposed rock surfaces in arid environments. Desert varnish forms only on physically stable rock surfaces that are no longer subject to frequent precipitation, fracturing or wind abrasion. The varnish is primarily composed of particles of clay along with iron and manganese oxides. There is also a host of trace elements and almost always some organic matter. The color of the varnish varies from shades of brown to black. Originally scientists thought that the desert varnish was made from substances drawn out of the rocks it coats. Microscopic and microchemical observations, however, show that a major part of varnish is clay, which could only arrive by wind. Clay, then, acts as a substrate to catch additional substances that chemically react together when the rock reaches high temperatures in the desert sun. Wetting by dew is also important in the process. An important characteristic of black desert varnish is that it has an unusually high concentration of manganese. Manganese is relatively rare in the Earth's crust, making up only 0.12% of its weight. In black desert varnish, however, manganese is 50 to 60 times more abundant. This significant enrichment is thought to be caused by manganese-oxidizing microbes (mixotrophs) which are common in environments poor in organic nutrients. Even though it contains high concentrations of iron and manganese, there are no significant modern uses of desert varnish. 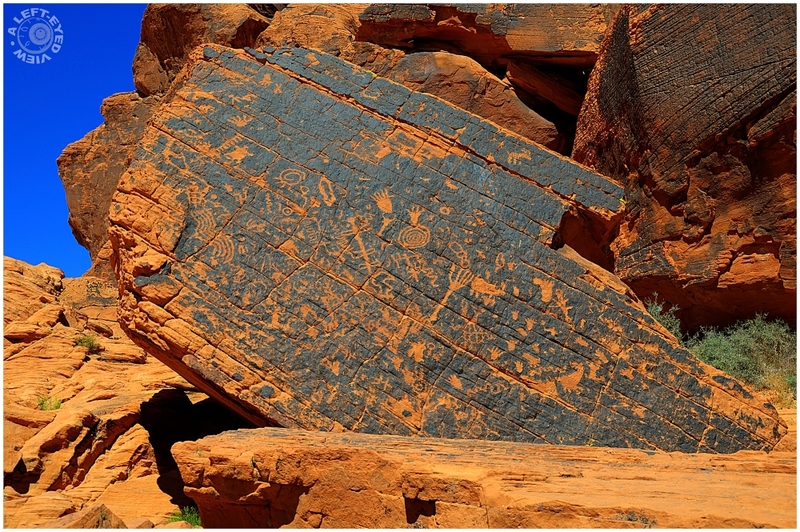 However, some Native American tribes created petroglyphs by scraping or chipping away the dark varnish to expose the lighter rock beneath, like those seen above. I couldn't help but think of this photo that I captured back in December of last year when seeing the swirls on the sandstone above. You might have found the blueprint here Steven! stunning find, and so very well captured. your blue and orange colors in this series are outstanding. Excellent details.. thanks for the information. A wonderful capture with beautiful colours . Well captured and presented. Thank you for very intresting information. Very cool photo and information about the varnish. I'd be curious to know how long those marking have been there. Excellent shot! So well documented - and the textures are stunning with this beautiful ocre. "Ancient astronaut theorists" would have a field day with this gorgeous shot! Hi Steven - great and well documented picture. It seems like we were tracking each other. interesting and absolutely fascinating patterns and designs, very informative introduction! Great find ! Nice colours and petroglyphs which I unfortunately couldn't decipher (lol). Thanks for all your physical and chemical explanations. Amazing formations . . like a living history in many ways . . .
Beautiful ancient art. The desert varnish has fascinated me for a while the way it streaks huge rock walls. An excellent photo.